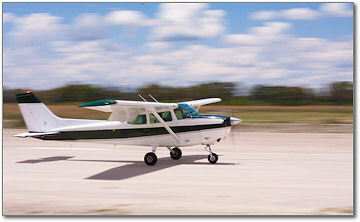 "My number one fear on approach is a stall spin resulting from low airspeed. As a result, I generally carry a little extra airspeed. Is this a good idea?" - Fred N.
"Extra airspeed is just that.....EXTRA airspeed. There is a very specific airspeed that should be flown on approach in a specific weight and configuration. The pilot should strive to maintain that airspeed. Having said that, there are times specified in the flight manual when additional airspeed is recommended to deal with strong or gusty wind conditions. This is not extra airspeed, but recommended speed to deal with specific conditions. There is always a price to be paid for carrying extra airspeed. All pilots should check out the performance section of the flight manual to see the additional landing distances required when speeds are increased. Don't forget the energy formula. Energy equals one half mass times velocity SQUARED! Energy is what will keep you sailing down the runway both before and after touchdown. Fear is obviously a major distraction. Overcome that fear of stall in the practice area by being comfortable flying your aircraft at Minimum Controllable airspeeds. Once you do that, you will be much more comfortable in the traffic pattern at speeds that you have flown and understand!"